Abstract. In a changing climate, potential stratospheric circulation changes require long-term monitoring. Stratospheric trace gas measurements are often used as a proxy for stratospheric circulation changes via the mean age of air values derived from them. 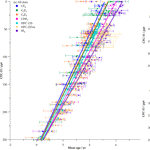 In this study, we investigated five potential age of air tracers – the perfluorocarbons CF4, C2F6 and C3F8 and the hydrofluorocarbons CHF3 (HFC-23) and HFC-125 – and compare them to the traditional tracer SF6 and a (relatively) shorter-lived species, HFC-227ea. A detailed uncertainty analysis was performed on mean ages derived from these new tracers to allow us to confidently compare their efficacy as age tracers to the existing tracer, SF6. Our results showed that uncertainties associated with the mean age derived from these new age tracers are similar to those derived from SF6, suggesting that these alternative compounds are suitable in this respect for use as age tracers. Independent verification of the suitability of these age tracers is provided by a comparison between samples analysed at the University of East Anglia and the Scripps Institution of Oceanography. All five tracers give younger mean ages than SF6, a discrepancy that increases with increasing mean age. Our findings qualitatively support recent work that suggests that the stratospheric lifetime of SF6 is significantly less than the previous estimate of 3200 years. 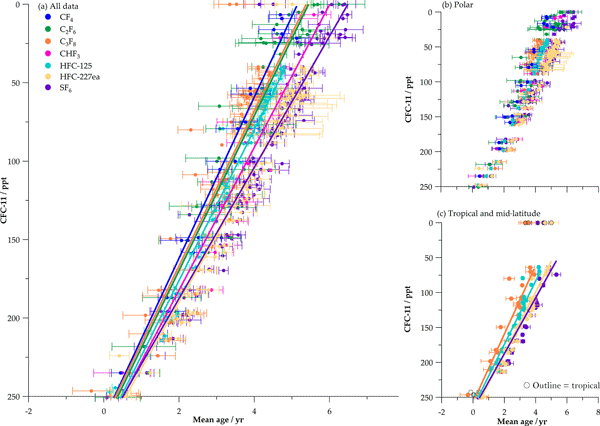 The impact of these younger mean ages on three policy-relevant parameters – stratospheric lifetimes, fractional release factors (FRFs) and ozone depletion potentials – is investigated in combination with a recently improved methodology to calculate FRFs. Updates to previous estimations for these parameters are provided. How to cite: Leedham Elvidge, E., Bönisch, H., Brenninkmeijer, C. A. M., Engel, A., Fraser, P. J., Gallacher, E., Langenfelds, R., Mühle, J., Oram, D. E., Ray, E. A., Ridley, A. R., Röckmann, T., Sturges, W. T., Weiss, R. F., and Laube, J. C.: Evaluation of stratospheric age of air from CF4, C2F6, C3F8, CHF3, HFC-125, HFC-227ea and SF6; implications for the calculations of halocarbon lifetimes, fractional release factors and ozone depletion potentials, Atmos. Chem. Phys., 18, 3369-3385, https://doi.org/10.5194/acp-18-3369-2018, 2018. Chemical species measured in stratospheric air can be used as proxies for stratospheric circulation changes which cannot be measured directly. A range of tracers is important to understand changing stratospheric dynamics. We demonstrate the suitability of PFCs and HFCs as tracers and support recent work that reduces the current stratospheric lifetime of SF6. Updates to policy-relevant parameters (e.g. stratospheric lifetime) linked to this change are provided for O3-depleting substances.